This model is discontinued. The successor is LE-150PR. LE-150PS is a lightweight communication protocol analyzer has a Data Logger function to record data in the SD card for long hours. It is an entry model designed for Asynch communication with excellent cost-performance. RS-232C interface supports 8 lines including control lines and it is able to operate the control lines automatically at Simulation function. 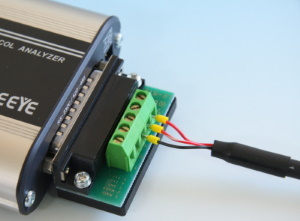 RS-422/485 interface is able to control the driver automatically at Simulation function. Do not allocate power supply of more than 6V to its 9/10/11/18/19 pin on the Dsub 25pin connector. It may cause the product malfunction. Support Async and PPP communications. It is possible to select bit transmission order, polarity, and data format (NRX/NRX) and able to analyze efficiently. In this setting, if finding an error, “1” will be added in the “Conter1”. Details of counters can be checked by selecting Timer/Counter window. And, the value of counter can be another trigger condition. In this setting, if finding data of “41h, 42h, 43h, 15h”, LED of U1 will be lighted. It is useful to check the flowing of specific data on the line without stopping the measurement. LED of LE-150PS will start blinking at 8:59 and be ready for measurement. It will start measuring at 9:00 and record data in the SD card for 450 files (4M each) as a ring buffer. It will stop measuring at 17:30 and turn off the power automatically to save on power consumption. * LE-150PS will start measuring from the next day if configuration is set after 9:01. To start measuring soon after the configuration, select the “Power On Run”. * If the trigger action (stop measurement) is satisfied, LE-150PS turns off the power automatically to save on power consumption. In this care, it is necessary to prove power to the LE-150PS from the same power supply for the equipment. Communication logs will be saved in the SD card for 500 files (1M each) endlessly. LE-150PS will stop measuring when the power is not supplied for more than 1 second after saving data in the SD card. * To record data soon after the power is supplied, select “Quick Start”. However, it is possible that SD card will be damaged from power failure. The palm-sized robust unit can be used between –10 to +55°C. 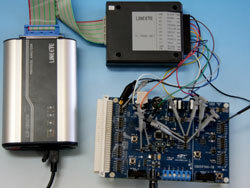 It operates not only on USB bus power, but also on external DC power of 8 to 26.4V. The consumption current is as low as 100mA at DC12V input. The SD card slot and the USB connector are equipped with a dust-proof cover that allows 2-way operation. It can be fixed easily to the equipment to be examined or built into an inspection line, since it is compatible with 35mm DIN rails. *1: AC adapter is sold separetely. In the Remote mode (with PC), it runs by the USB bus power. In the Logger mode (PC less), you need to have the optional AC adapter (6A-181WP09) or use the optional Power Plug Cable (SIH-2PG) and external DC power. *2: 8GB SDHC card is included as a set of LE-150PS from July 2012.